April 25th, 2018 | Moving For Work, Moving Tips. To minimize the disruption caused by a restaurant relocation, identify the challenges you face. Develop solid strategies to meet issues head on, and then enjoy a smoother transition to your new location. Here are three strategies to keep your relocation on the right track. During and after a restaurant relocation, the details matter. 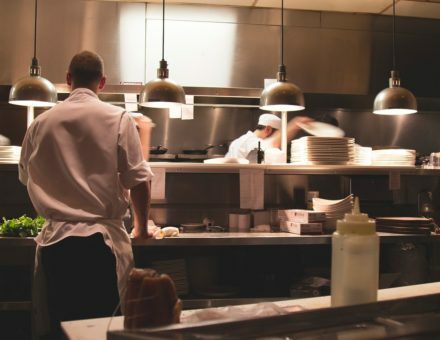 Anything from a delayed health inspection to a malfunctioning fryer can keep your business from reopening on schedule. When planning your move, list all of the areas of your restaurant’s operations. Ask experts about the regulations and other considerations for each area of your business. Remember to check ADA compliance of a new facility. Outdoor concerns include managing ice, snow, and other bad weather. Verify that your suppliers service the new area. A vendor may deliver to your new location on a different day of the week, so your staffing needs may change. Host a private event in the new location prior to opening to ensure your front-of-house operation is on the money. Any traffic, noise, draft, or seating problems can be corrected before you open to the public. Prior to opening, have chefs use equipment as they would on a normal service night. You can fix any kinks in the works before your staff cooks for patrons. Follow all departing lease terms to the letter when you leave the old location. Clean up after yourself per your lease agreement before surrendering the keys to your old landlord. Your business reputation will benefit from your good will. Know which fixtures are yours to keep and which are part of the building. In some cases, a piece of kitchen equipment belongs to the restaurant business; in other cases, the equipment is owned by the landlord. Have your attorney explain any written rules or lease terms you don’t understand in both your old and new leases. For example, if you lease commercial space in a mall for your new food service location, your landlord can include a relocation clause. This clause essentially allows the landlord to move you at any time during your lease period so another tenant can use the space. Your attorney will ensure any such relocation clause includes wording to protect you. This protection may include compensation and the cost of a new restaurant build-out. You should stipulate in your lease that you chose the original location due to its exposure to traffic, scenic view, or other features. If the landlord cannot guarantee the same conditions over time, they must compensate you a specified sum. When you research and ask experts about the details in the checklist above, you’ll learn exactly how long it takes to complete moving requirements. When talking to experts, take the time to jot down the time periods necessary to achieve your goals, including the time needed to apply for and receive licenses, a new HVAC installation, carpeting, and other needs. Use what you know to develop a timeline to move your restaurant relocation along. If you know it takes two months to complete illuminated signs for your new location, be sure you order the signs three months in advance. This gives you extra time for the sign installation. Contact your commercial relocation specialist well ahead of your move. Business movers know how to safely pack up, transport, and set up your precious kitchen equipment and dining room furnishings. However, most good movers need some advance notice to adhere to a precise restaurant relocation schedule. Contact Wheaton World Wide Moving to set up a professional and efficient restaurant relocation through our hospitality experts. We offer secure interim storage for kitchen equipment during your move too.